My Grandma turned 89 in February. A couple months ago we went shopping for a new pair of slippers. She balanced on one foot while untying her shoe, slid her foot out of her shoe and into the slipper. She may have held my hand through the process, but her balance was impeccable. And this is a woman who had polio as a child. Her legs are two different lengths. There was a point in her life when all her leg muscles had atrophied after spending months strapped to a wooden board, immobilized. she couldn’t get in on her own. I’m not sure when something turns from fun game with Grandma to elder abuse, but luckily no special tactics were needed. We did lay down a blanket, and we all crawled in—my mom, my grandma and me. 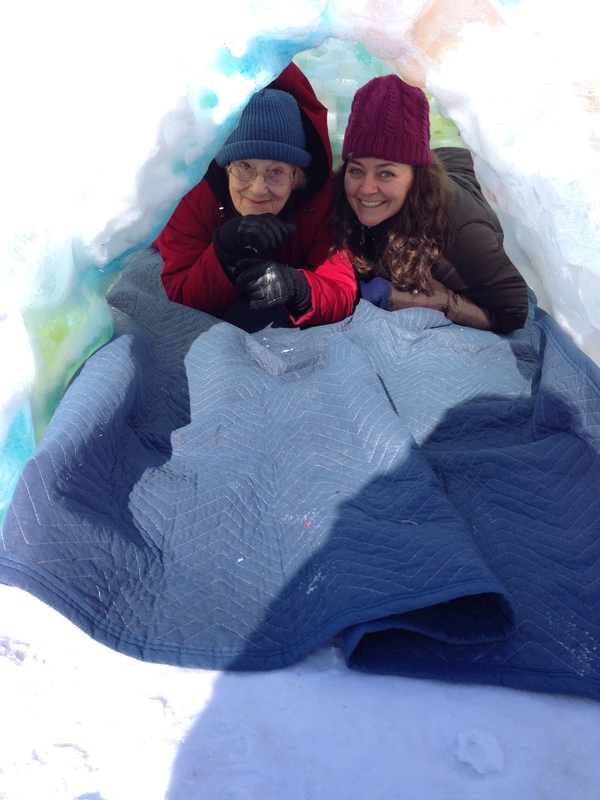 We spent about 15-minutes in that igloo, my Grandma grinning ear-to-ear the entire time. That moment with her and her smile will make me feel good for the rest of my life. It feels good that the igloo makes so many strangers happy. It feels extra good to make someone you love so much happy. And February can be a tough month for my Grandma. She lost my grandfather a few years ago in February. Plus, it’s February. It’s friggin’ cold and snowy, making the shortest month feel like an eternity. “I never had an igloo when I was ten,” she responded. I got even happier. 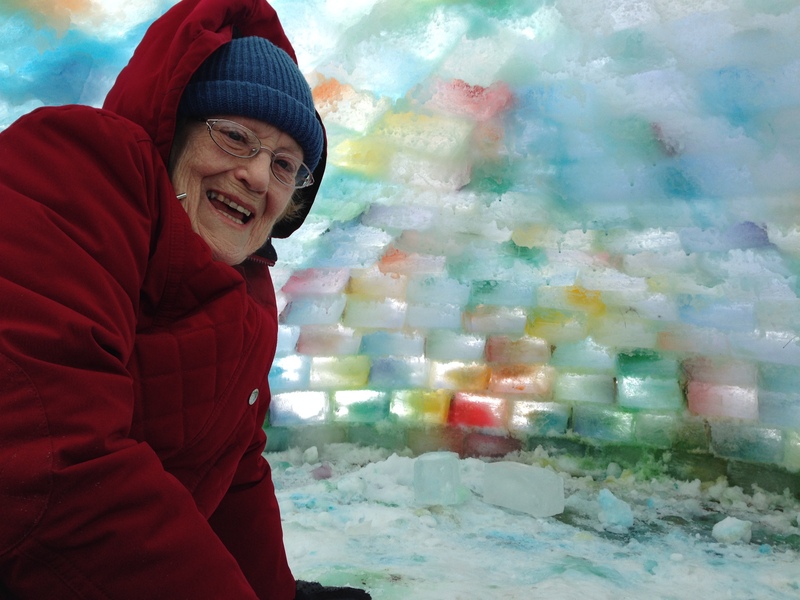 She may not have had an igloo at ten, but she had one at eighty-nine because she can still move well. If we can stay mobile and active, we can always have a new experience. I’m glad I have her genes for lots of reasons. 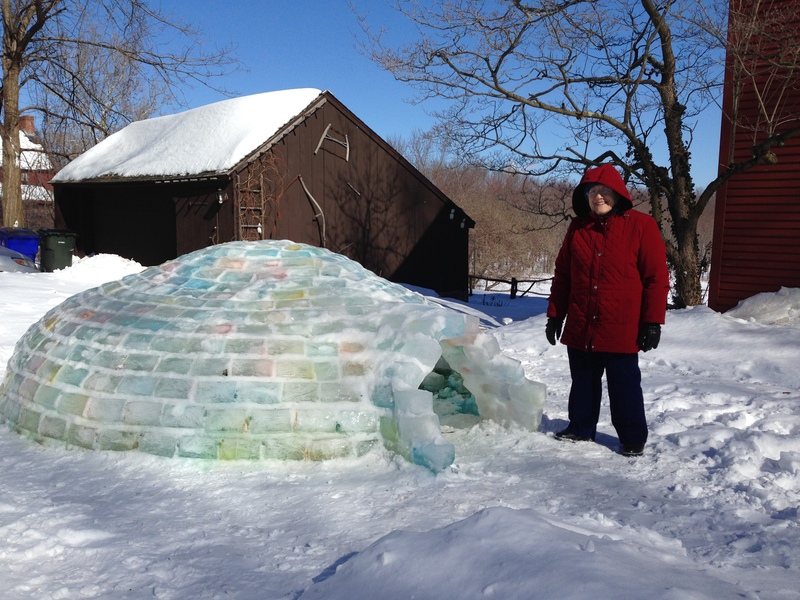 Today, I’m glad because she’s the type of woman who wants to get inside a rainbow-colored igloo. 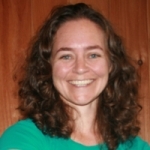 I love, Love, LOVE this blog! Thanks for recreating a beautiful memory, Maggie.